My love affair with Antigua began in the year 2000, when my best friend and I visited (we were living in Costa Rica at the time) and decided that the town was just so beautiful, moving there was a must. From 2001-2003, I called the colonial city and former Guatemalan capital my home, during which time the love affair blossomed. I worked full time, lived a fairly normal life (Antigua is far from roughing it), except that nearly every day, after greeting the Maya women weaving textiles in the park near my house, I would imagine where I stood on the world map, in what was once the capital city of all of Central America. By 2003, it was time to move on, but the love affair with Antigua never ended. Now, seven years later, in the bus from Guatemala City I felt jittery, excited and nervous to visit and see how things had changed. On the bus less than halfway to Antigua from Guatemala City, I spotted through the window something most unusual. Mono Loco, always one of Antigua’s more famous gringo bars, had a big, bright, well-branded billboard on the side of the highway. Then we whizzed past an even bigger billboard for the Casbah, Antigua’s only nightclub (both then and now). Billboards? Advertisements? Don’t things like that need budgets and marketing knowledge? Back in the day, the bars, clubs and restaurants like Mono Loco were party places where the owner was just as likely to be hanging from the rafters as the clientele. We were all travelers, of the same ilk. Just as I was remembering a time when one such owner (who shall remain nameless) actually did hang wildly from a balcony back in 2002, I glimpsed a second billboard for Mono Loco. Suddenly I realized that these owners were no longer ex-backpackers; they are business owners, and they, like myself, were all grown up. In terms of tourism, the UNESCO World Heritage site of Antigua has also developed and matured. Back in the day, with great hostel choices, guaranteed hot water, excellent food choices, free movie nights and language schools, Antigua was always the spot where we dirty, grubby backpackers could clean-up, relax, eat some European or North American fare and prepare for the onward journey. Some ended up staying longer than planned, and several of my friends there had just ended up staying in Antigua all together. 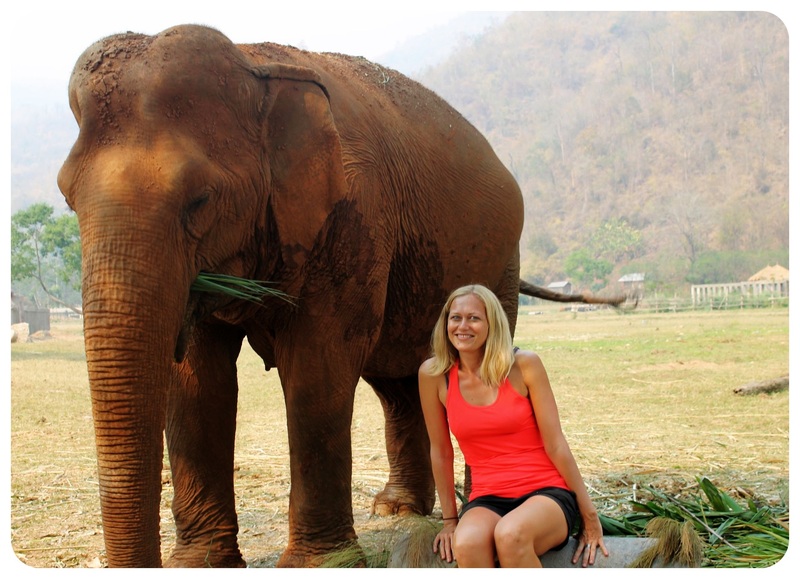 Today, young travelers still rule the tourist scene, but there are plenty of mainstream tourists now too, including families, older retired folks from the US, Canada and Europe, and even large tour groups from further afield, like Japan and China. The growing number of mid-range accommodation and three luxury hotels make Antigua much more welcoming for these visitors. The increase in tourists, and the passage of several years, has meant that the old hang out spots are now dead, and new places have popped up and become popular. One night during our first week in Antigua, I insisted to Dani that we go to Riki’s Bar to try to relive some of the madness that used to ensue here on a nightly basis. What happened instead was depressing. Imagine a birthday girl, hat on, waiting for guests to arrive and when they don’t, she eats the cake (with her name misspelled) all by herself. This was our Riki’s experience. The old hangout was dead. Rather than cry in our soup, we set off to discover the best places to eat, drink, relax and explore in Antigua today. My beloved Antigua might have changed, but we can still easily keep up. Read on for what we discovered. 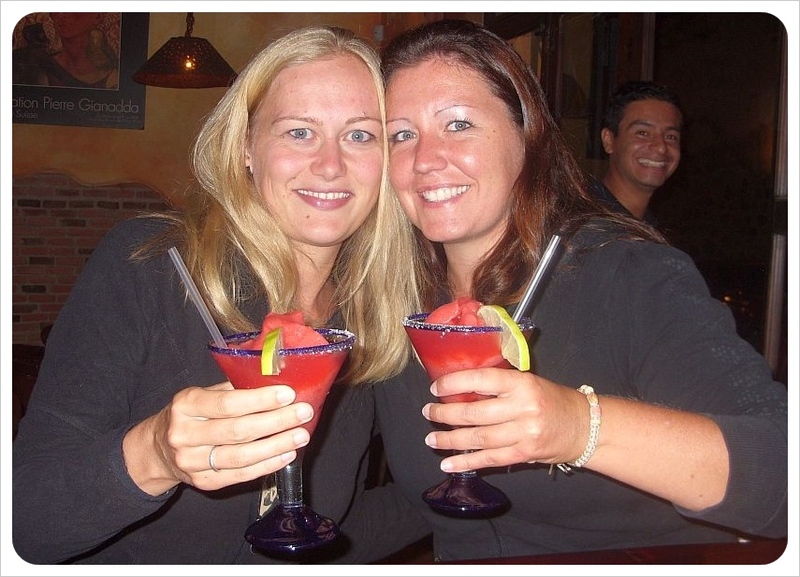 As mentioned above, Mono Loco is the typical gringo hang out, and a bit over-priced. But the burritos are huge and seductively delicious, as are the nachos, and just like at great Mexican restaurants at home, no Spanish is necessary here. For breakfast, head to the beautiful courtyard at Doña Luisa, a bakery and breakfast spot serving up a long list of Guatemalan, American and International favorites. People-watching is also great here, where diners are a mix between middle class Guatemalans, poets, families, businessmen and backpackers. For cheap eclectic food by ambient candlelight, try Travel Menu, going strong since before 2000. Café Rocio is the best Thai/Indian cuisine we have found since starting our travels. The restaurant is cheaper than the more ‘famous’ Thai option, Café Flor, and the food is much tastier, too. For cheap local food, I was relieved to see that Café de los Mixtas, near the ‘supermarket’ La Bodegona, is still going strong. The family run restaurant has set lunch menus running from $2-$4 including freshly made juices and fruit shakes. Since I was there last, they have opened up a rooftop terrace with at least six more tables. For your sweet tooth, try the ‘pasteleria’, located on 2nd calle oriente between 4th and 5th Ave norte. We don’t even know the name, but the courtyard, which is hidden from the street, is filled with locals who know that this is the best cake in Antigua. Try the banana chocolate cake and the cheesecake. For food as cheap as chips, stop at La Merced church on the weekends and special occasions for all the street food you can eat at $1.50 an item or less. Directly across the street, tucked into a tiny space that could be easily overlooked, is the very special Hector’s restaurant (rated #1 on TripAdvisor in Antigua for restaurants). For budget travelers this might be a budget-buster, but especially worth it for meat-eaters. The food is perfectly-prepared fine European cuisine, the wine might make you weep, and yet the experience is not pretentious. Instead, Hector will spend time chatting to you, and although your wallet will be lighter, so will your spirits. The newest restaurant on the scene is Angie Angie, which opened on 1st Avenue in October. The Argentine artist Angie is a long-time Antigua resident and a familiar friendly face on the scene. Her first stand-alone restaurant/café is a true accomplishment. The food, chocolate and coffee is all organic, the wi-fi is free, the staff are super friendly, and the restaurant doubles an art gallery, with sculptures, photography and paintings on the walls, tables and floor. For bagels, great coffee, free super-fast wi-fi and free movies every night of the week, Bagel Barn (and now Bagel Barn II) is there to please. Las Palmas restaurant takes the free movie night concept one step further. The restaurant, which also has a huge menu of decent international cuisine, shows three movies a day in a private movie room in the back. Should only your group show up for one of the movie times, they’ll let you choose any film you like from their massive movie library. Ask anyone where to go out in Antigua, and the answer will most likely be Reilly’s. This Irish bar had just opened before I left in 2003, and from the start, Reilly’s Sunday pub quiz was a hit. Today Reilly’s is still Antigua’s most popular bar with foreigners. La Chiminea isn’t the party place it once was, but the space is big, the pool tables are fun, and the food and drinks are very cheap. For jazz, hang out at Ocelot, for dancing the overpriced La Casbah ($4 cover charge, $5 drinks), which is big with people from Guatemala City, who drive their SUVs into town every weekend to dance here. The super cool El Afro has since been renamed La Sala, but is still as popular a watering hole as ever. This is a hard-drinking hang out bar with some drunken dancing late at night. For a very trendy cocktail experience, head to Cargo Room, a little known restaurant/bar in the back of Lex Cargo’s fabulous jewelry shop. While most of the bespoke jewelry designs in the shop might be out of range for a budget traveler, let celebrity jeweler and local television star Lex, who will greet you at the door and sweep you inside with his fabulousness, lead you back to his restaurant for cocktails that even cocktail haters will love. Prices are similar to U.S. drink prices, but even just for one, the ambiance and a chat with the inspiring and elegant Lex is worth it. Our top tip in Antigua for a night out is Café No Sé. This bohemian ‘outpost’, whose slogan is ‘because every dive needs a town’, serves great Mexican food and has a Mescal bar with over 30 kinds of tequila and mescal, plus loads of beer and hard stuff, and each drink is served up with popcorn (free). A Tripadvisor review says Café No Sé feels like a border dive in a Tarantino film, but filled with ex-pats and wanna be ex-pats. Go there. Trust us. In addition to all the enjoyable eating and drinking, the once earthquake-ridden city has countless ways to spend your days. Much of present-day Antigua was constructed in the 16th century, and loaded with gorgeous ruins of cathedral and churches. Depending on your interest level, you could spend a day exploring the many ruins. Hike up to Cerro de la Cruz, the cross up on the hill that provides a perfect view of the colonial city, or for a view to Antigua’s interesting past, visit the gorgeous all-white San Lazaro cemetery at the southeast end of the city. Although we visited both places alone with no problems, we were warned that both can be dangerous alone, so go with a group, a guide or at least when there are many visitors. If you still have the energy, make your way over to Antigua’s ‘gallery row’, a square block of art galleries with gorgeous original works by Guatemalan artists, including Alejandro Wer. Outside of Antigua, visit nearby Ciudad Vieja or San Antonio Aguas Calientes for a glimpse of very traditional Guatemalan villages, or take one of the countless organized tours, including a climb up the ever-erupting Pacaya volcano or a visit to Finca Filadelfia or Finca Azotea coffee farm, to see how the delicious Antigua Guatemala coffee makes it from the farm to your cup. If these activities get costly and run up your budget, there are several places with great views to relax and reflect. At the risk of alienating almost our entire readership with this next sentence, it is an ‘insider’s tip’ we must share: Go to McDonalds. Really. 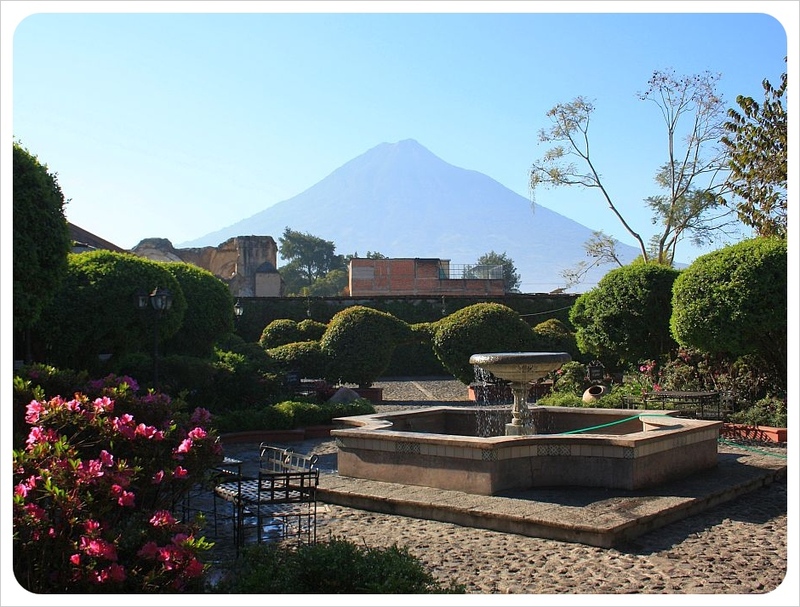 The spacious courtyard at the Antigua McDonalds is a stunning garden filled with tropical flowers and hummingbirds, plus every table has a perfect view of the giant volcano Agua which looms over the city (courtyard pictured below). For views of the erupting volcano Fuego, find any rooftop terrace restaurant and grab a drink, and for the ultimate in people-watching, order an ice cream at the delicious Marco Polo ice cream shop and people watch in Antigua’s super green central park. If you are traveling with at least two people, we can recommend as highly as possible what we consider the best place to stay in Antigua: Yellow House. The 8 bedroom, two-dorm hotel and travel agency on 7th in between the main market and La Merced is the best budget choice in town. Stay tuned for a full hotel review, but Yellow House (review here) has friendly staff, comfortable beds, cable TV, a large rooftop terrace with hammocks, couches and books, a kitchen, excellent wi-fi, the cleanest shared hot water showers we have found so far and the price includes a filling breakfast of porridge or pancakes, plus eggs, beans, potatoes, bread, sweet bread, fruit and coffee for Q150 or $18 per room per night. I wish I had read this before I went there. I got sucked into the touristy stuff so I wrote the city off and left after two days. I’d heard that it’s too touristy but your tips have sold me. It sounds like a good, liveable place to base ourselves for a while. Another fantastic report -thank you. Hey no problem! I have a thing when people call Antigua too touristy – people don’t stay away from New York or Paris because it’s too touristy. Tourists go because it’s awesome, and so it is with Antigua. There are a lot of apartment opps in Antigua, so you’ll find something. However, while I love my Antigua, and recommend you visit a week for sure, don’t discard Lake Atitlan either. San Pedro (people say it’s touristy/gringos/drugs – fooey) is beautiful, the wi-fi is excellent, the food is so good, and everything is cheaper than Antigua too. Apartments a little more difficult to come by, but totally do-able, there is a gym and the Lake is really magical. Get in touch if you need advice, we spent 2 months in Guatemala this time round, so are pretty up to speed! great post girls! we both love antigua too. another great place to eat is toku, the falafel place. and we should definitely put in a plug for our friends at the black cat hostel! even if you dont stay there, its a top place for some very cheap drinks to start the night before kicking on later. love the photos too! Hi guys, first of all – where is Toku?! I am sad, upset and hungry all at once that we didn’t know about this falafel place…didn’t even hear rumors of it, but top of the list for next time. And I raise my hands up high and admit that you are definitely right – the Black Cat Hostel is definitely pre-party drinking hotspot! Any other suggestions from you two Antigua experts are more than welcome! I LOVED Antigua, I know it’s touristy, but I love it nonetheless. I went for Semana Santa! Btw, sorry if you’ve answered this in another post, but what camera do you use? Your pics are outstanding!!! Hi Andi – touristy it can be, but Semana Santa is madness! One million people are in Antigua for the event then, and like nothing else in the world. 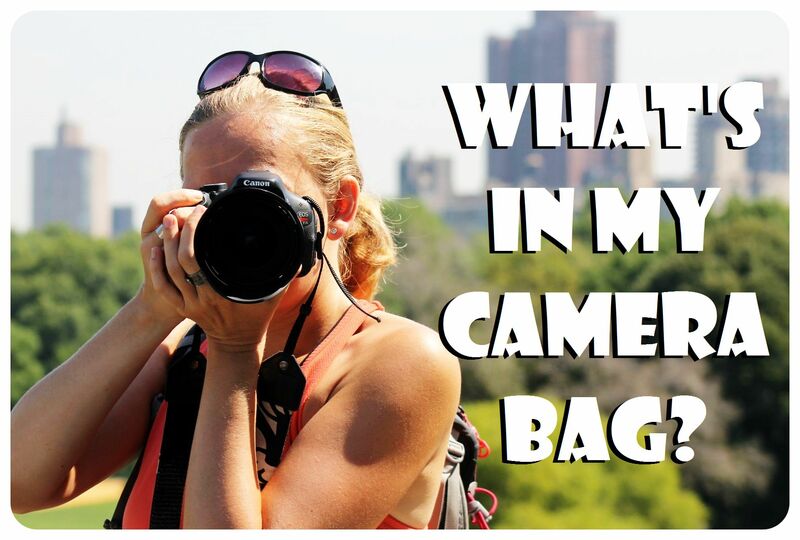 Dani uses a Cannon EOS 1000D camera – it was one of our best purchases ever! Glad you like the pics! Wonderful job describing a wonderful place. I, too, love it and will point wary friends of mine to this page in the future when convincing them to go. The unnamed bakery with the fabulous cakes (my fave is the chocolate cream cake) is called La Cenicienta. Hi David – you are awesome! We weren’t sure if that was the name, so we’re glad you said that about the bakery. Feel free to point the Antigua wary folk to us! It’s a great city, definitely worth a good visit. Thanks for reading! What perfect timing! I was just getting ready to e-mail you guys and ask for some Antigua tips. I’m heading there on Wednesday! This post is super helpful! Antigua is very photogenic indeed!! Somehow I ended up taking 400 pictures there. It’s a good place to hang out for a while, if you have the chance to go back one day. This is a great overview of Antigua! Guatemala is one of my tops on my bucket list; hopefully I will go there soon. Lately I’ve read so much about Antigua, so has become a must for me. Antigua is a wonderful place to settle for a while. As you guys said, it’s touristy, but there is also great things to find that are fun, rare and cultural. We took some Spanish lessons here, hiked Pacaya and made some great friends. I would go back and live there for a bit. Jason, happy that you agree that Antigua is a place to hang out for a while – it seems to have such a ‘bad’ reputation among backpackers who usually avoid it or only stay for a day or two. As you say, it’s a great place for Spanish lessons. 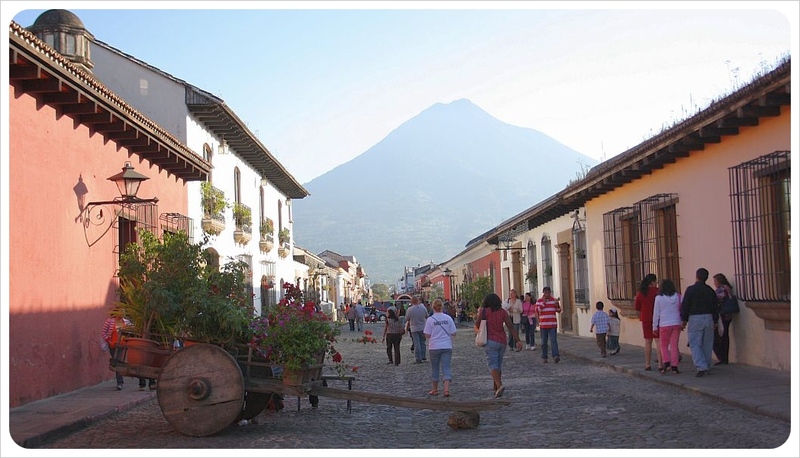 Many people prefer Xela to learn Spanish but we think that the Antigua experience is way more fulfilling all around. I spend everything birthday in a different country and in 2007 I was in Antigua, Guatemala. I also fell in love with this place, the people and the food. Hotel Casa Santa Domingo is still one of my favorites in the world, and nothing beat having dinner in a cave or hiking down a live volcano. Lex! Glad you saw the article, and it sounds like we need to come back to try the new menu (and maybe buy some of your fabulous jewelry, too!) We’ve sent at least one fellow traveler your way, he should be arriving in late April, early May and can’t wait to visit you. Hope all is well in Antigua!! The unnamed bakery with the fabulous cakes (my fave is the chocolate cream cake) is called La Cenicienta. Another fantastic report -thank you. There are a lot of apartment opps in Antigua, so you’ll find something. This post is super helpful! Thoughts on Yellow House for families with small children? We’ll be in Antigua this fall and traveling with a 5 year old and 3 year old. Hi Clark – Yellow House is good, clean, relatively cheap and comfortable. There is an unintended extra layer of security in that it’s tucked behind a travel agency, so the kids would have to actually get through the travel agency before escaping out onto the street! 🙂 The thing is, there are no big rooms with three beds, for example. You could either see if you can rent out the entire dorm (it’s only four beds) or upstairs the corner room is bigger and has a private little part of the terrace where you could have more space. However, there is a mixed crowd of guests which on a few nights included some drinking and hanging out (but not always, much of the time it was very adult and peaceful and there is a curfew out on the top patio….) Other hotels with big green areas will cost much more, though, so it’s a tough call. Showers are downstairs and shared but super clean…why don’t you write them – [email protected] – they speak English and are very accommodating! Great posts about Anitgua. I understand the love affair with this beautiful town as I’ve visited it off and on since the mid 70’s. I’m coming to Guatemala this November and am thinking of staying at the Yellow House. I”m 62…travelling solo. Do you think this would be a fit? Also I’m hoping to travel to the Ixil Triangle; an area I’ve yet to explore. Any information about this part of Guatemala would be greatly appreciated. Hi Nancy – we stayed at the Yellow House two different times and there was usually a good mix of all ages there. I think you’d definitely meet some travelers at your age there, but also younger ones. The Yellow House was definitely NOT one of the ‘party hostels’ 🙂 We haven’t been to the Ixil Triangle yet, only passed through there on the way to Todos Santos, but I think our friends over at http://trans-americas.com have been there and covered it on their site. Enjoy your visit in November! I love your posts I have been freaking out over all the negative sights and wondering if you feel like it is a safe place to visit with my daughter who is 20. We have an apt four blocks from main square. I am paranoid about the buses from point a to b keep reading about robberies, kidnapping and rapes. I have travelled alone to India and around the world. Just with my daughter makes me worry. I am sounding like a big fat chicken, I think I might be. I have spent a lot of time in Antigua…even had an apartment there a few years ago. I like this town, lots of conveniences and things to do and see. The problem is that you cannot go out at night and I dont care what anyone else says….it’s not safe. Lots of incidents are not for public knowledge but those in the know, know…..this type of information affects tourism!!! Be careful there is all I am saying. Hi GTGirls! We found your review of Antigua really useful before our 3-week stay there, including a language school. Cafe No Se is definitely still the coolest spot. Emily, that’s so unfair!! Your photos make me feel like jumping on the next plane to Guate 🙂 Love your pictures! Hello there! I was one of the owners of El Afro and since I sold it to go to Europe, I have not been back…Thank you so much for bringing back amazing memories. Anna, I hope you’ll get to go back soon! When did you leave Antigua? I’ve heard it’s changed a lot even since I was there last in 2011. We will be arriving by cruise ship for 1 day and will have approx. 5 hours to spend in Antigua. Any suggestions what to see with such a limited timeframe? By cruise ship, wow! Which port does it dock at that they offer a day trip to Antigua? I am curious 🙂 I’d say just wander… Antigua is so compact and with its grid layout, you can’t get lost. Go see some of the ruins (Santo Domingo, Convento La Recoleccion), make your way up to Cerro de la Cruz, a viewpoint with nice views over the city and the volcanoes (find out what time the guided walks with the tourist police are, it’s safer that way). 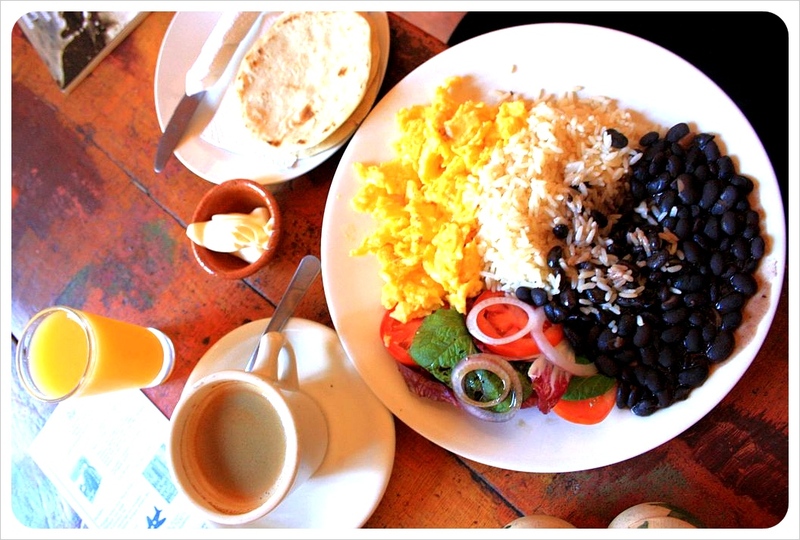 Take some time to eat or have coffee in one of the beautifully restored courtyards (Cafe Condesa, Tretto or Las Antorchas for example).. visit La Merced, take some time to take in life at the Parque Central, pick up a map and visit some of the churches, which are beautiful. There’s also an artisan market (corner of 2nda Avenida Norte and 2nda Calle Oriente, I believe – if not there, then a block north or a block west of it) where you can buy some handicrafts, art, fabric, etc, if you want to pick up some souvenirs. I would check Tripadvisor for a nice restaurant – there are so many now, and so many new ones 🙂 Enjoy this wonderful town, George! Also a former local, I know the pain and pleasure one experiences to come back and see the changes in the city. It’s hard to see a place you once called home change without you there but it’s also inspiring to watch the city grow and evolve and see other newbies fall in love with their own version of Antigua. It’s been over two years since I moved away but I go back every few months! My husband and I (he’s Guatemalan) were so inspired on our last trip that we have decided to create a blog that focuses solely on the positive promotion of Guatemala so that others can the beauty of this place and its people. Chelsea – I am dying to go back to Antigua, I keep thinking about how I can fit it into my travel plans 🙂 Now I have to head over to your site because I love that you say you want to share Guatemala’s beauty — always happy when people are spreading the word because Guatemala is such a special place for me. Loved your post on Antigua. I myself lived there for 7 months (3 months were planned originally) this/last year. I think it is an extremly addictive place, due to it’s beauty and everything going on there! I wasn’t bothered by the act that it is quite touristy at all, but that might be due to me working at local places rather than very touristy hostels etc. there. Even 4 years after your article was published I agree with mostly everything you said and most of the recommendations you made still exist today. some i am kind of sad I never tried in all those months now though 😛 But I also found a few cafés and bars that i spent all my freetime at and although I just returned a few months ago I already can’t wait to be back there! I fell in love with Antigua and I am saving up all my money to go back as soon as I can! Thanks so much for sharing! We’re heading to Antigua for the first time later this month. Can’t wait to explore – such a beautiful city! It’s definitely one of the prettiest towns in Central America – if not the prettiest one! I think it is. 🙂 Enjoy Antigua, Shannon! Great Post! We are going next month for a wedding, as part of the hen party we would like a bartender to come over to the villa in Antigua to make cocktails – do you have any idea where I can start looking to find a bartender? Thanks for sharing your local’s guide! There are some really great tips which I will be remembering when I am in staying in Antigua for my first time next month. I am so excited to be staying in Antigua and it looks like such a lovely and beautiful place. I’d love to hear how you like Antigua, Brittany – it’s been a while since I was there.. dying to go back!